HAPI is the OSHO Humaniversity’s one-year rehabilitation program. For over 30 years, the HAPI Program has helped hundreds of men and women overcome their addictions by replacing the unfulfilled needs that fuel dependency with satisfying human contact. By helping participants understand what lies behind their dysfunctional behaviors and giving them real experiences of positive change, the HAPI Program has achieved a drug-free success rate of 70 percent (*See below). Our therapists each have over 20 years of experience working with addictions. They are themselves former addicts and able to identify with the participants from personal experience, with wisdom, compassion and understanding. If I Can Change, You Can Do It, Too! There was a period in my life when I was convinced that the only important thing was a shot of heroin. My whole life seemed to justify it, and I was good at justifying. When it was bad weather in the morning, it was time for a shot of dope. When it was good weather, it was the perfect time for a nice shot of dope. If I didn't have any money, I needed a shot badly. When I was going to have a date, I made sure to have a shot. When I was going out for a job, I needed to have a double shot so that I could get myself together. Everything was centered around taking dope. I did that thoroughly on and off for 14 years. When I started doing therapy, the group leaders exposed my addiction. That was hard to accept. My image was blown. But they also said there is another side of me. With their help I learned to focus the energy I had used to get high on drugs in a positive direction. That's why I’m here today, living in this beautiful community and helping people to change their lives. If I could do it, you can do it. You can change. You can say, ‘Enough.’ You can take the same energy you have been using against yourself, and point it in the direction that makes you feel good. That is called maturity. And when you learn to understand yourself, that's called awareness. With this understanding, you will change immediately. We work with a wide range of addictions, including substance abuse, eating disorders and sexual obsessions. The Humaniversity community is able to provide a highly structured environment that teaches you how to be responsible for your life. Being on time, communicating clearly and working together are emphasized, along with emotional work like encounter, stress release, bodywork and meditation. In a safe environment you will face problems you would normally escape from and learn ways to deal with stressful life situations. We will give you a map showing you who you are emotionally and how to change your behavior in a positive way. We will teach you how to develop healthy and loving relationships. In this supportive setting, you will find out that you are loveable and at the beginning of a journey of self-discovery which is far more rewarding and permanent than the high of any drug. Beginning with the Tourist Program, you will participate in workshops and sessions every day. After successful completion you will move to the Student Program. Your fellow participants will be both addicts and non-addicts, and a great deal of your learning will come from your relationships with them. Advancing each step of the way through the program, you will be given greater and greater responsibilities and begin to teach others what you have learned from your own life experience. This will reinforce your understanding and build your self-confidence. HAPI is about acquiring a healthy, meaningful vision in life. On your path to authentic rehabilitation you will discover our bottom line: love is always the answer! 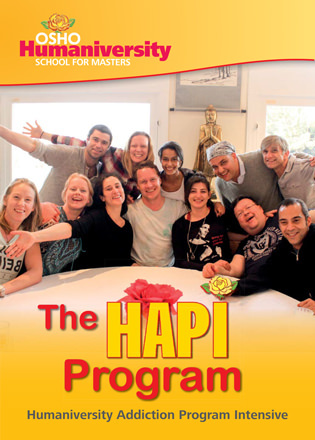 Contact Sangitama M. Hübner, program leader of the HAPI Program, or call us at +31 (0)72 506 4114. Before entering the program you must be clean for a minimum of two weeks and have the results of a Hepatitis and an HIV antibodies test. The program is ongoing. You can start any day of the year. The minimum commitment is three months. * The success rate of the HAPI Program is based on the percentage of total participants who stayed drug-free for six months or more after leaving the program. The program’s success rate is 72 percent for 25 years of operation from 1983 to 2008.